UK, 1948, 95 minutes, Black and White. Robert Beatty, Simone Signoret, Gordon Jackson, Jack Warner, James Robertson Justice. 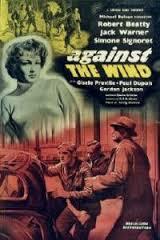 Against the Wind is a war spy thriller made within three years of the end of the war. Besides being a well-made English film, it shows us something of how the English viewed the war effort and the work of the espionage-saboteurs at that time. There is quite a lot of suspense and excitement, less spectacular than more recent spy films but spectacular nonetheless. Interesting viewing, raising questions of espionage and war. 1. This film was made within three years after the end of World War II. Is this obvious? How? 2. Contrast the style of this action-spy film with the war and spy films of the 60's and 70's. Where do the differences lie? Which is the better type of film? Which is the more genuine? 3. Was the Control, played by James Robertson Justice, typical of the wartime head of department? 4. How necessary were these saboteurs? How heroic did they need to be, e.g., in volunteering as well as in action? 5. The priest, his actions credible? Should he have acted as a spy as well as a priest? 6. There were strong warnings on spies not getting emotionally involved. Is this necessary? Why? How did it affect people? 7. The traitor, he belonged to no land, no loyalty; he wanted money, Why was he a traitor? Was he following his beliefs? 8. What does the film communicate, the realities of fighting and war; heroism in crisis situations; the value of human relationships?